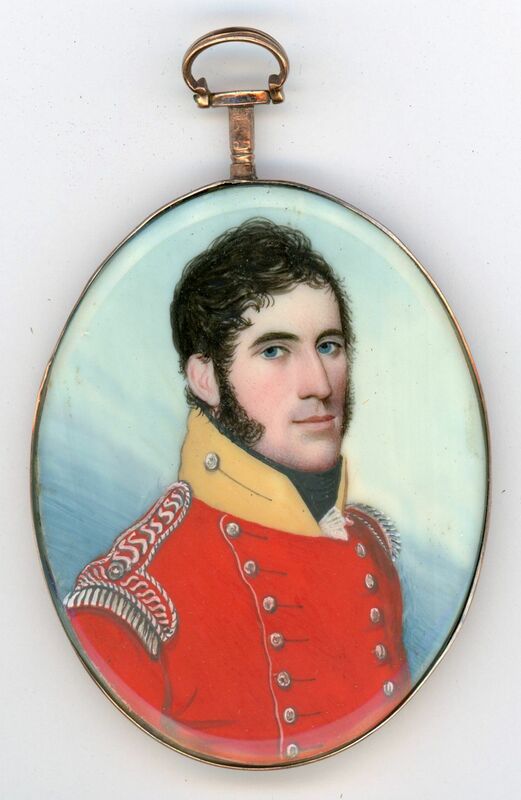 This gentleman with his floppy curls, lush sideburns and sultry look is reminiscent of ‘George Wickham’, one of Jane Austen’s most memorable characters introduced as a young militia officer with a charming demeanour but later revealed to be unprincipled and manipulative with a compulsion for gambling. We can but hope that this officer in his red coat faced with yellow and decorated with silver epaulettes does not harbour any such dark secrets. The portrait has been painted by Irish-born Frederick Buck, a prolific and resourceful artist working mostly in his native Cork where his sitters comprised the local gentry and the passing military. He married twice and had at least eight children. The miniature is in very good condition with bright original colours; it is set in a rose gilt frame that is enclosed on the reverse.